Popular vote by riding. As this is a first-past-the-post election, seat totals are not determined by total popular vote, but instead by results in each riding. 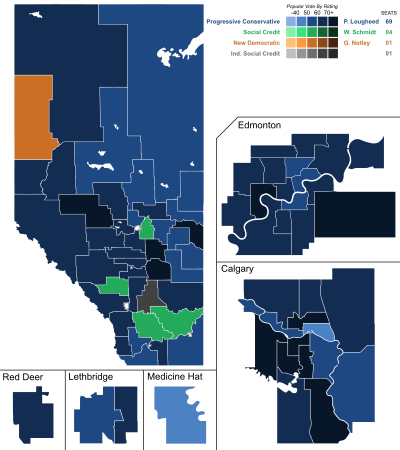 The Alberta general election of 1975 was the eighteenth general election for the Province of Alberta, Canada. It was held on March 26, 1975, to elect members of the Legislative Assembly of Alberta. The Progressive Conservative Party of Peter Lougheed won its second term in government in a landslide, taking over 62% of the popular vote and winning 69 of the 75 seats in the legislature. The Social Credit Party saw its vote collapse. After 36 years in government from 1935 to 1971—virtually its entire history—it was ill-prepared for a role in opposition. It lost over half of its popular vote from the previous election, and was cut down to only four MLAs—just barely holding onto official party status. Overall voter turnout was 59.58%. For complete electoral history, see individual districts. ^ Elections Alberta (November 25, 2007). "General Elections 1975-2004 (Overall Summary of Ballots Cast and % of Voter Turnout)". Archived from the original on August 15, 2011. Retrieved April 29, 2011. This page was last edited on 3 December 2018, at 20:46 (UTC).